What this means is that at some point in the past men who carried this Y chromosome underwent a very rapid expansion. So rapid that the genetic tree simply “explodes,” rather than accumulating mutations in a gradual manner which could outline different relationships between parental and offspring Y chromosomes. 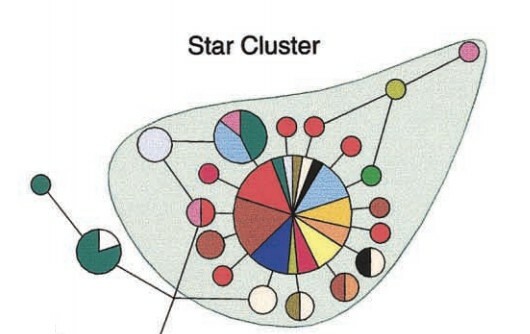 By looking at the pattern of diversity of the branches of the star lineage scientists concluded that this cluster must have expanded about ~1,000 year ago in the past. What happened about ~1,000 years ago? 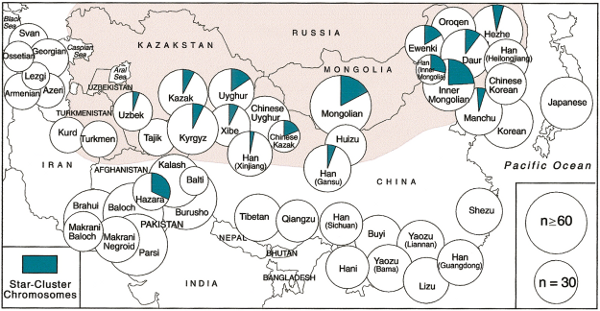 It is notable that the lineage, the “star haplotype,” is most diverse and frequent in and around Mongolia. 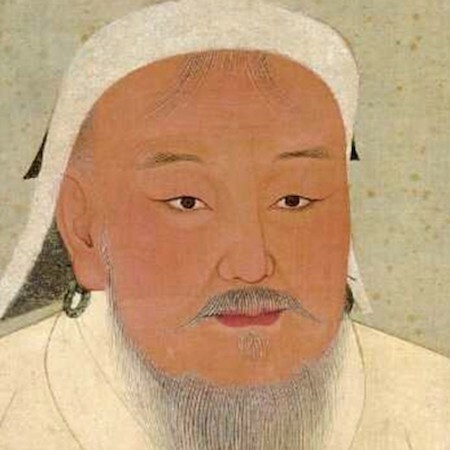 The conclusion was unmistakable: this Y-chromosome lineage comes down from the tribe of Genghis Khan, and its explosive growth occurred due to the explosive growth of the Mongol Empire. Genes reflect history and social norms. The history of the Mongol expansion and the extermination of local elites across vast swathes of Inner Asia has left its legacy in the genomes of modern people, with the signature of explosive growth in the Genghis Khan Y haplotype, which stretches far and wide. The persistence and frequency of this lineage across nearly 1,000 years attests to the social prestige attached to be a direct male scion of Genghis Khan and his descendants. The cultural importance of descent from Genghis Khan in Inner Asia can not be underestimated. Though he was a pagan through-and-through, among Muslim Turkic peoples descent from him became highly prestigious, and a mark that one was meant to rule. In the case of the the Genghis Khan Y lineage there is a historical record that explains the cause of the genetic phenomenon. What about other Y-chromosomes? 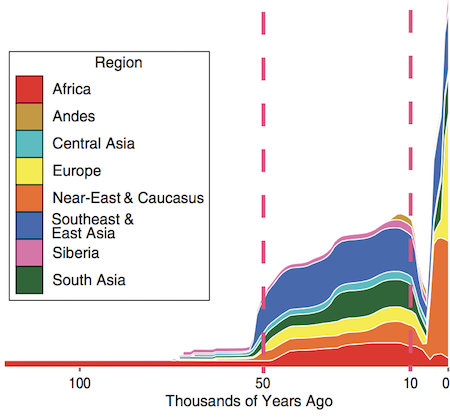 It turns out that about 4,000 to 5,000 years ago a widespread bottleneck followed by an expansion occurred specifically on the Y chromosome for many lineages, not just one. This is particularly true of Eurasia. For example, Y haplogroups R1a, R1b and I1 seem to have undergone expansion at this time after a population reduction. R1b is the most common haplogroup in Western Europe. R1a is the most common in Eastern Europe, Central Asia, and much of South Asia. I1 is the dominant haplogroup of Scandinavia. But 5,000 years ago ancient DNA tells us that R1a ad R1b were very rare where today they are common. I1 seems to be a relic of the Pleistocene hunter-gatherers of Europe, but it only began expanding at the same time as R1a and R1b. Unfortunately 5,000 years ago most of the world was cloaked in prehistory. History provides few clues about why a few Y chromosomal lineages came to be so dominant. But we do know that this was around the time when pastoralism and horse-powered warfare, in the form of the light chariot, came into being. New research suggests that only theoretical models that rely on “inter-group competition” can explain the Y-chromosome pattern we see. That is, it can’t be polygyny, where a few men have many wives within the tribe. Rather, it has to be a tribe as conceived of as a patrilineal kinship unit. 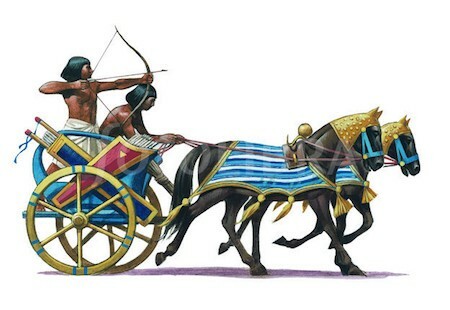 The victory of one tribe was total loss for the males in another tribe, and each tribe was represented by a particular Y-chromosomal lineage. 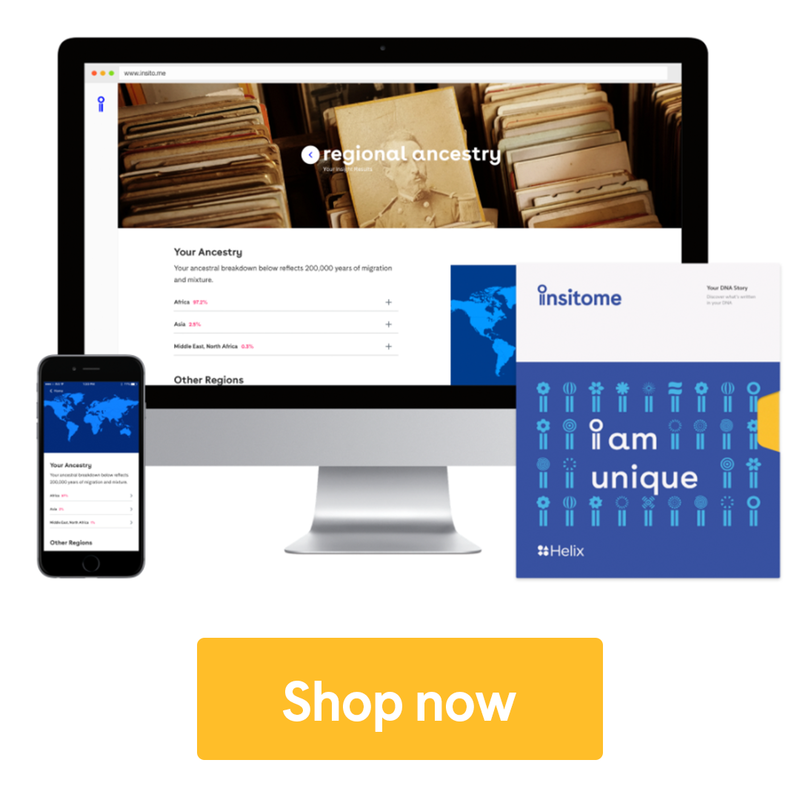 The days of the All-Fathers was originally published in Insitome on Medium, where people are continuing the conversation by highlighting and responding to this story.